NATURALLY RECYCLING - MB S.p.A. Recycling is one of the most suitable work environments for SSAB steel. Its high resistance and anti-wear properties find their natural use when put to work. MB is an organization that needs little introduction. From its creation, synonymous with bucket crushers, it covers 90% of the market share globally. A company that has always been founded on innovation, with the recent expansion of the production plant, MB focuses completely on the excellence of the Made in Italy mark, managing the entire production chain (from folding steel sheets, and surface finishes to the assembly) within the new Fara Vincentino (Vi) headquarters. With four quality certifications, MB meets the demand of providing products built with high-tech materials and with a high level of resistance to abrasion for sustaining a crushing job 24 hours a day. In particular, the BF 150.10 bucket by MB, with a patented grinding system, is one of the biggest in the world. 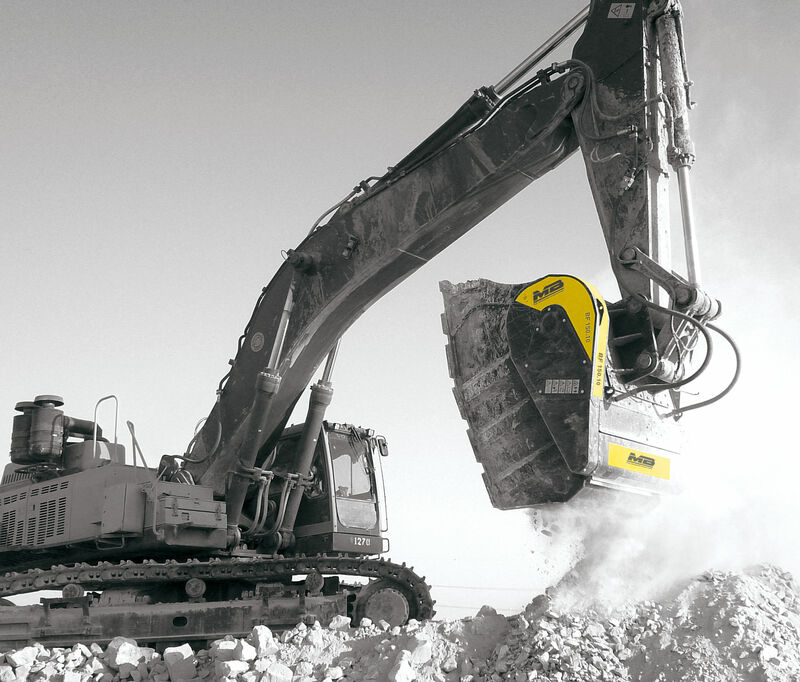 Weighing over 10 t (suitable for excavators of over 70 t) and with a load volume of 2.30 m3, it guarantees a productivity of 120 m3/h for recycling jobs, demolitions, or excavations in large sites. The bucket is part of an optimized delivery system according to the JIT (Just in Time) policy that has brought the company to take on the arduous task of finding materials of high enough quality to guarantee not only the company standards, but also the reduction of internal work times, thereby meeting client expectations in terms of efficiency and delivery times. These production demands have found a solution in SSAB's Hardox, the anti-wear sheet capable of ensuring a product life cycle triple that of a normal steel sheet. Hardox's specific properties are the result of a careful selection of extremely pure minerals (originating directly from Swedish mines belonging to SSAB) and an innovative control system, AccuRollTech, which ensures uniformity in the sheet thickness with an even higher margin of tolerance than that established in the EN 10029 standard for sheets up to 80 mm. At a practical level, thanks to its particular tenacity and high degree of hardness, Hardox facilitates the processing of debris from the crusher bucket and ensures a reduction in work times. Additionally, such qualities allow for the use of thinner but more resistant sheets, with a consequent increase to the payload of the bucket. The result is an optimization of the entire work process, from the production of the crusher buckets to their efficiency once they are installed on site. The adoption of this steel has made it possible to eliminate the risk of cracks or other defects during the folding phase, maximizing the production and delivery times and at the same time ensuring the quality of the products.